An affirming, revealing examination of the painful effects of shame—with new, powerful strategies that promise to transform a woman’s ability to love, parent, work, and build relationships. Shame manifests itself in many ways. Addiction, perfectionism, fear and blame are just a few of the outward signs that Dr. Brené Brown discovered in her 6-year study of shame’s effects o An affirming, revealing examination of the painful effects of shame—with new, powerful strategies that promise to transform a woman’s ability to love, parent, work, and build relationships. Shame manifests itself in many ways. Addiction, perfectionism, fear and blame are just a few of the outward signs that Dr. Brené Brown discovered in her 6-year study of shame’s effects on women. While shame is generally thought of as an emotion sequestered in the shadows of our psyches, I Thought It Was Just Me demonstrates the ways in which it is actually present in the most mundane and visible aspects of our lives—from our mental and physical health and body image to our relationships with our partners, our kids, our friends, our money, and our work. After talking to hundreds of women and therapists, Dr. Brown is able to illuminate the myriad shaming influences that dominate our culture and explain why we are all vulnerable to shame. We live in a culture that tells us we must reject our bodies, reject our authentic stories, and ultimately reject our true selves in order to fit in and be accepted. Outlining an empowering new approach that dispels judgment and awakens us to the genuine acceptance of ourselves and others, I Thought It Was Just Me begins a crucial new dialogue of hope. 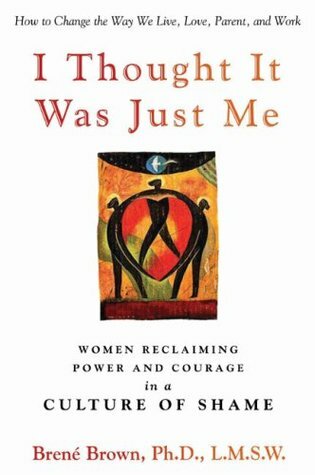 Through potent personal narratives and examples from real women, Brown identifies and explains four key elements that allow women to transform their shame into courage, compassion and connection. Shame is a dark and sad place in which to live a life, keeping us from connecting fully to our loved ones and being the women we were meant to be. But learning how to understand shame’s influence and move through it toward full acceptance of ourselves and others takes away much of shame’s power to harm. It’s not just you, you’re not alone, and if you fight the daily battle of feeling like you are—somehow—just not "enough," you owe it to yourself to read this book and discover your infinite possibilities as a human being.